With Captain America: Civil War rapidly approaching, we’re starting to see a lot of cool new toys based on the film make their way to shelves—and leading the charge at Toy Fair this weekend was Hasbro’s Marvel Legends series. Captain America and Iron Man, the two film’s heavy hitters, were present. But Black Panther was the star. Four figures in the Civil War wave of Marvel Legends 6-inch figures due for release around the time the movie premieres will be directly based on the movie versions of Marvel’s heroes. 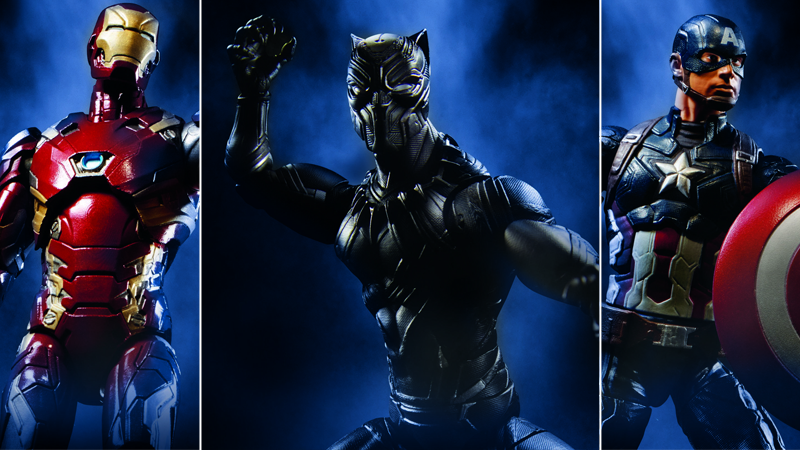 Captain America, Iron Man, and Black Panther are pictured above, and also a version of Scarlet Witch in her new costume for the movie is below. Marvel Legends Civil War Scarlet Witch. Those figures will be joined across two different Captain America waves, the remaining slots filled by characters associated with Cap from the comics—Nuke (who recently showed up in Marvel’s Jessica Jones Netflix show), the Red Guardian (a very weird and old Marvel character that was meant to be the Communist Russian equivalent of Captain America), and Nick Fury, Sr.
Marvel Legends Nuke, Red Guardian, and Nick Fury. Comic books, ladies and gentlemen. But it wasn’t only Marvel’s new movie that got some love from the Legends line. For the first time in what feels like ages, there will be an entire wave of figures based on Marvel’s mutant characters—something many fans didn’t expect, as the company has been infamously reticent with X-Men merchandise in recent years. Marvel Legends Kitty Pryde, Rogue, and Phoenix. Rogue, one of the figures in the wave, was announced at New York Comic Con last year, but she will be joined by fellow mutants Cable, Iceman, Phoenix, Havok, Kitty Pryde, and—hot off the heels of his movie success—Deadpool, although it’s a figure based on his comic book appearance, rather than the movie suit. Marvel Legends Iceman, Havok, Cable, and Deadpool. Later in the year, to line up with the November release of Doctor Strange, the Sorcerer supreme will get his own inspired wave of figures focusing on the mystical side of Marvel heroes and villains. Marvel Legends Dormammu, Iron Fist, and Nico Minoru. Not shown were movie and comic book versions of Stephen Strange himself, but they will be joined by long time Doctor Strange villain Dormammu, soon-to-be-Netflix-star Iron Fist, and Nico Minoru, a breakout character from the Runaways comic book that is now a main character in the female-lead Avengers team series A-Force. Marvel Legends Ultimate Spider-Man and Hobgoblin. But it wouldn’t be Marvel Legends without a Spider-Man wave. And no, before you ask, the character’s Civil War appearance did not get a figure nod, so the toys have yet to spoil how the webslinger will look in Marvel’s cinematic universe. Hasbro rounded out their Legends reveals with four new figures that will be part of a new Spider-Wave later this year. Marvel Legends Silk and Miles Morales, Ultimate Spider-Man. Included are Spider-Man (naturally), specifically the “Ultimate universe” version of the hero, the Hobgoblin, and two firsts for the 6-inch line: Silk, a spider-hero introduced during the 2015 comic event Spider-Verse, and Miles Morales, the Latino Ultimate Spider-Man who replaced Ultimate Peter Parker, who’s since gone on to join the “main” Marvel universe in his own series. This is Silk’s first-ever figure, and Miles’ first 6-inch-scaled one. It seems like just as DC comics fans are in for a wallets’ worth of pain this year, Marvel fans have just as much to be excited about.